UIA executive director Jolly Kaguhangire (right) being shown a map of the area under the investment park in Mbale. Photo by Badru Afunadula. Uganda Investment Authority (UIA) has promised it will pay compensation to families affected by industrial park development in Mbale by the end of September. The pledge was made by UIA Executive Director Jolly Kaguhangire while on a tour of industrial parks in the Eastern Uganda districts of Mbale Soroti and Karamoja (Napak and Moroto). In Mbale industrial park 619 acres of land was acquired with a total of 864 claimants recorded as per the Chief Government Valuer’s report. Uganda Investment Authority has so far compensated 758 families leaving 106 families yet to be compensated. Meeting Mbale’s local leaders, Kaguhangire assured them that the remaining batch of project affected persons will be compensated by next month. 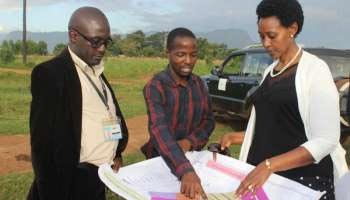 She appealed to the displaced persons to have continuous face to face interactions with the neighbouring community to avoid unwarranted wrangles that deter potential investment in the Mbale Industrial Park. Visiting the 182-acre Jinja Industrial Park site located in Kagogwa village, occupied by Kiira Motors Corporation (100 acres); Pearl Health Sciences Limited (10 acres); Uganda Electricity Distribution Company Limited (12.4 acres); Nile Fishing Company (3 acres) and Uganda Free Zones Authority (20 acres), she said UIA will extend an 11KV power line to the industrial zone. In Soroti, Kaguhangire encouraged investors to apply for land here because it is a strategically located park. Power lines have been extended to the park, some sections of the roads are tarmacked and several other murram roads have been opened. Soroti Fruit Factory already setting up in the park is planned to start operating by January 2018. She also visited Guangzhou Dongsong Energy Group Co. Ltd, a Chinese group of companies. The Chinese firm is set to invest on a 600-acre facility in Tororo District to manufacture and process fertilisers, glass and steel products from phosphates deposits in Osukuru. This phosphate plant is expected to officially commission in February 2018 and hopes to produce 100 tonnes of fertiliser per annum with planned direct employment of 1,200 Ugandans.